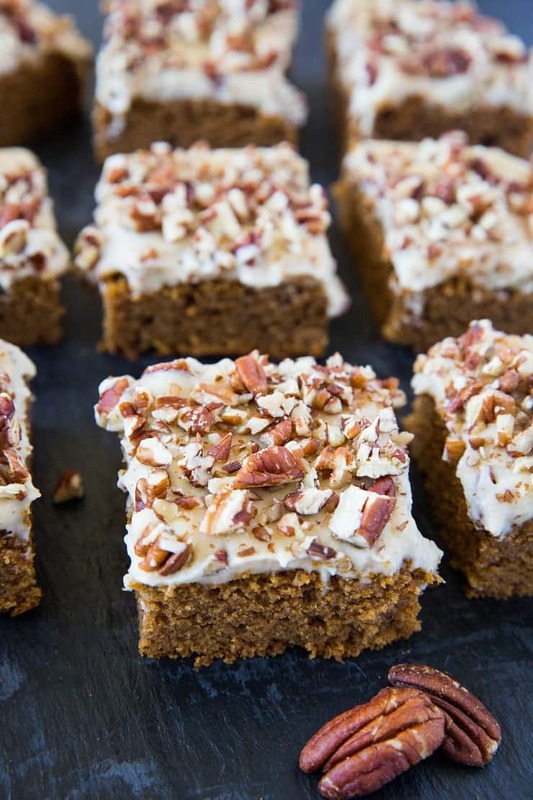 Moist and delicious pumpkin snack cake made grain-free, egg-free, and dairy-free. 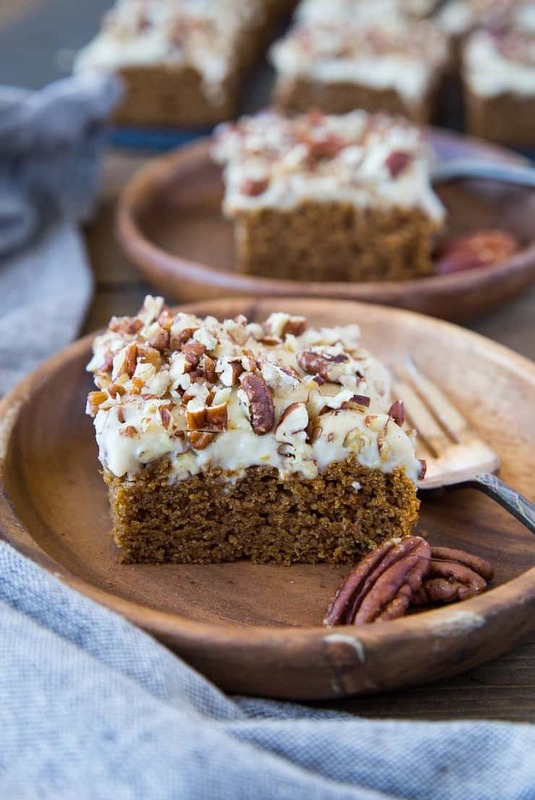 This paleo and vegan pumpkin snack cake is healthy enough to eat for breakfast! 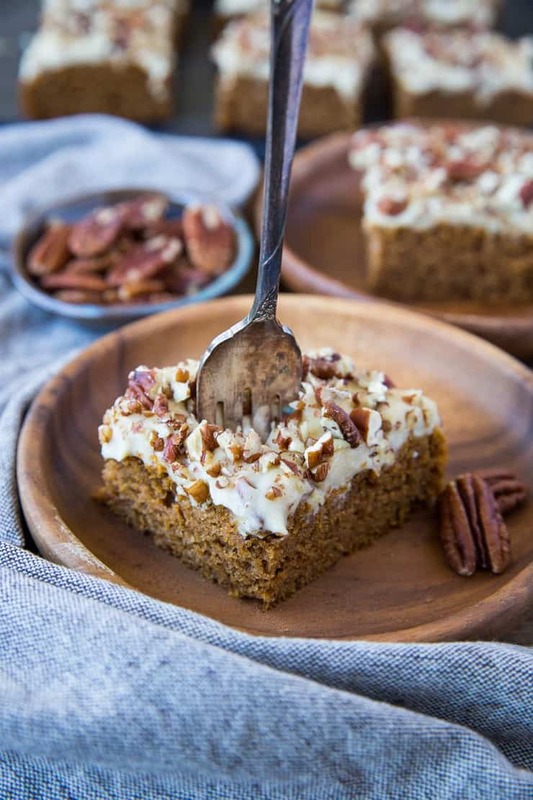 While I’m conscious of my sugar intake, for me there is nothing like sharing comfort food and warmly-spiced treats with friends and family over the holidays. Cozying up with a slice of homemade cake on a dark, chilly evening with the people who matter the most to you is such a simple pleasure. We often take for granted how liberating (and healing!) it can be to detach from technology and be present for our loved ones through lighthearted conversation over a slice of cake. 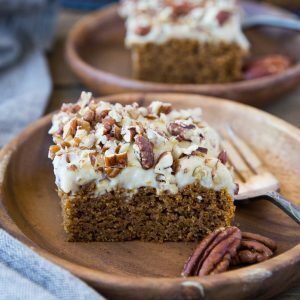 This paleo Vegan Pumpkin Snack Cake arguably my favorite holiday-inspired dessert recipe I’ve made to date. It’s just simple, unpretentious, and beautifully flavored. I used Thrive Algae Oil in the cake to keep it nice and moist while providing quality monounsaturated fats. 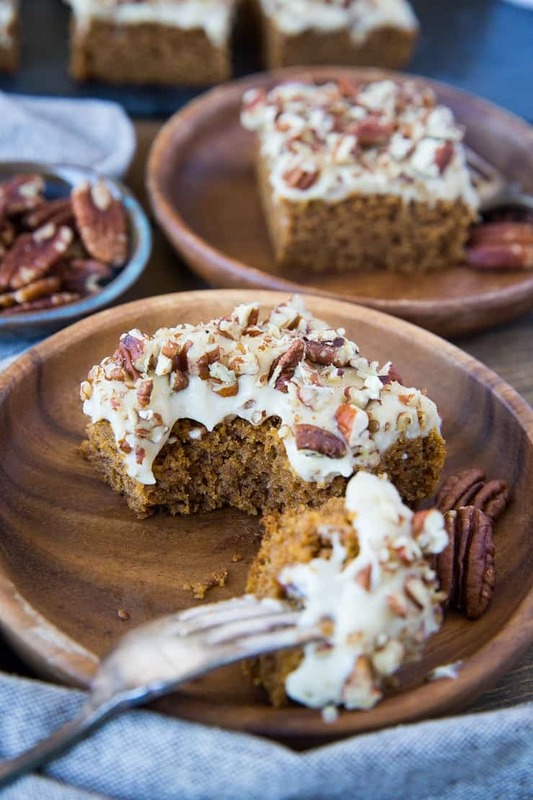 Unlike olive oil, algae oil is virtually flavorless, so it doesn’t impact the flavor of the cake – all of the pumpkin spice flavor shines! 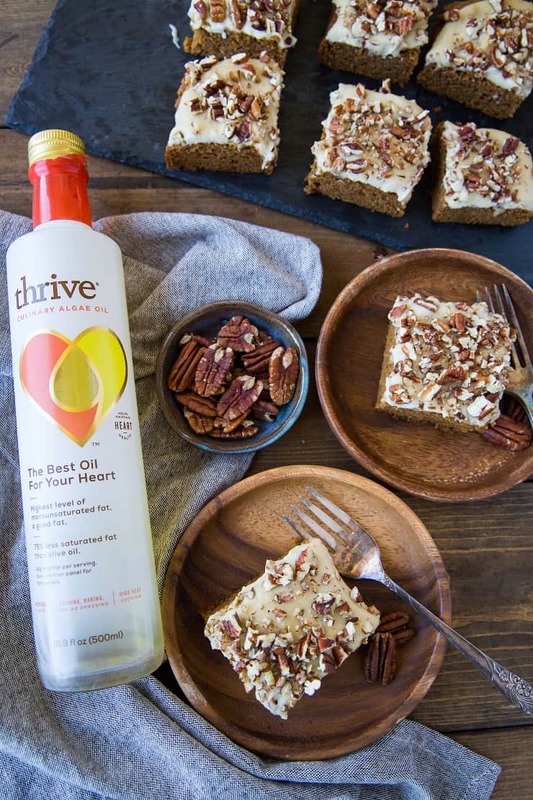 If you haven’t checked out Thrive algae oil yet, you can find it Wal-Mart, Target, and many other grocery stores. You can also check out their Store Locator or or purchase it online through Amazon. You have probably read this in my Roasted Winter Vegetable Quinoa Salad and Instant Pot Turmeric Chicken and Root Vegetables posts recently, but algae oil is generally what I use when I’m cooking at high temperatures. I also love it for baking due to how deliciously subtle the flavor is as well as its nutrition benefits. Let’s discuss the dairy-free (and vegan) “cream cheese” frosting I used for the cake. I simply whipped up a batch of my Vegan Cream Cheese Frosting, which is made with raw cashews that have been soaked, pure maple syrup, lemon juice, and a little almond milk. I absolutely thoroughly enjoy the thick, creamy tangy frosting on top of the cake, but you can easily save yourself some time by skipping it altogether – the cake itself is nice and flavorful and doesn’t necessarily need additional pizzazz, but hey, if you’re going to get wet, you might as well swim, right? Do note that the frosting recipe yields more than you need for the cake. To me, this just means you get to brainstorm on how you’re going to use the rest – for frosting paleo cupcakes? A sassy topping for a nice banana bread? Consuming as is, one spoonful at a time? You’ve got options and I trust you’ll make the right decisions. Replace the ground flax seed and water (flax “egg”) with 1 regular large egg. Substitute hazelnut flour for the almond flour. Swap arrowroot flour for the tapioca flour. Use raw cane sugar instead of coconut sugar. Omit the pecans from the topping or replace them with walnuts. 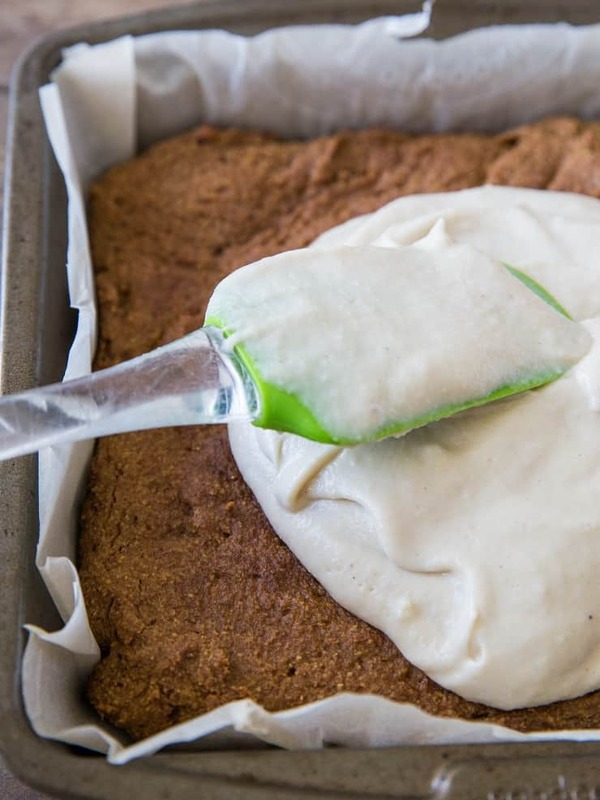 Make the vegan cream cheese frosting up to 5 days ahead of time in order to prepare this recipe in parts. You can also omit or replace the frosting with your topping of choice. Stir together the ground flax seed and water in a small bowl. Allow the mixture to sit, stirring occasionally, for 15 minutes, until it thickens and is the consistency of an egg. Preheat the oven to 350 degrees F and line an 8” x 8” baking pan with parchment paper. Once the flax egg is ready, transfer it to a bigger mixing bowl and add in the pureed pumpkin and algae oil. Stir this mixture until well-combined. In a separate bowl, combine the remaining ingredients (almond flour through ground cinnamon) and stir well. Pour the wet pumpkin mixture into the bowl with the dry flour mixture and stir until combined. Pour the cake batter into the prepared baking dish. Bake for 22 to 28 minutes, until the cake has set up in the center and edges are beginning to turn golden-brown. Remove from oven and allow cake to cool completely before topping it with the cream cheese frosting. Sprinkle the chopped pecans on top. Slice, serve, and enjoy! I want to eat this cake right now! I have had a pumpkin craving for a month, but stay away from all the sugary stuff. My mouth is actually watering as I am looking at the pictures! My husband and I are mid Whole30. Frosting sounds off limits for now, but is there a possible sub for coconut sugar? Any rec omendations to make this Whole30 approved ingredients, would be much appreciated! Theoretically, baking a cake, even if using Whole30 ingredients is what the folks in the Whole30 world caution against. The purpose of Whole30 is to avoid using food for comfort, so alas, there isn’t a way of making a cake Whole30 approved, unfortunately 😀 Hope you guys try the cake after the Whole30 is complete!